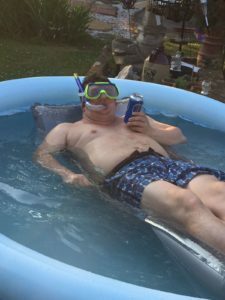 So this week kicked off for some with a wonderfully welcome paddling pool party at Steve’s (Bass Guitar/Winston Churchill) lovely home in sunny Romford complete with 5 home made curries and plenty of Kool Aid to go round! There was much merriment to be had as we rounded off our fortnight in London Town, even though Kirsty (Wardrobe Mistress) managed to believe that a can of Fosters had fallen from the sky into the pool, leading her to think that her life is now the Truman Show! 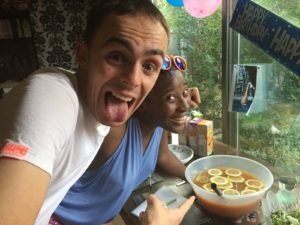 Meanwhile, Shekinah (Voice of Nora) rustled up a pretty lethal Rum Punch ably assisted by William (Tommy) and Adam (drummer) and Anthony (Rev Simpson) called on Tasha’s Digs Services… again… keeping with tradition, two days before we were due to arrive in Sheffield! 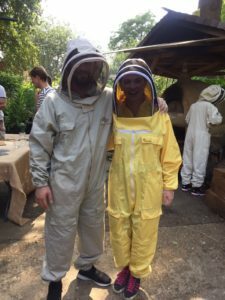 I suppose Adam did have his hands full as he and lovely GF Lucy trotted off to Kennington on Monday for a brewery tour involving bee suits and honey… fab stuff! Adam and Lucy are the bee’s knees! Tuesday saw the crew, stage management and wardrobe teams at the theatre to begin the fit up in our final venue (sad face), the awesome Sheffield Crucible which was to be yet another completely different space! While all that was occurring the majority of the cast were making their way up the country to settle into digs. Steve managed to wangle a free tram ride while Adam and I ended up having a 6 hour car journey which may have been my fault for wanting to go via the Greenwich cheese shop resulting in us hitting the road during rush hour! What can I say… it was good cheese! We arrived in Sheffield just in time to grab a drink with a few of the guys… but even that very nearly didn’t happen. Sadly our bar of choice had a ‘no shorts’ policy (in 28 degree heat) which meant that poor old Adam couldn’t come in. So he politely asked the bouncer “would you allow me in in a dress? 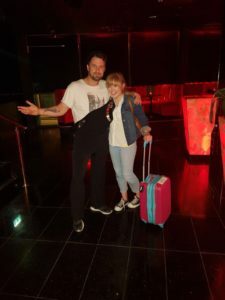 !” The bouncer replied “yeah!” Luckily Connie (Team Wardrobe) was on hand with her suitcase to aid the lad… and in the end Adam donned a Connie Playsuit and was able to join us for a couple of cocktails… wonderful! Well done everyone! Adam in Connie’s clothes – the lengths people will go to to get in a bar! We were all reunited at the Sheffield Crucible on Wednesday to get in our final tech of the tour and were very sad to learn that gorgeous Jeni Draper (BSL Consultant) had neglected to bake her legendary chilli chocolate cookies! Someone in particular was tres disappointed… can’t think who! As she’s such a busy bee we shall let her of this once! We had a super fun meet and greet led by Sheffield Chief Exec Dan where we learned that Peter (Acid Queen) had learned to spell his name in BSL… well done pal! He was rewarded with an extra seafood chowder for free with his dinner that evening… oh, and Shekinah got extensively sniffed by a guide dog during the warm up… ha! There was more ‘Walker Family War’ to be had on Thursday as Donna (Mrs Walker) managed to spit out her 7Up at lunch all over William, he then retaliated by spilling hot tea all over her… this could get messy! I found myself having to do an audition self-tape with the help of the fantastic Garry (Uncle Ernie) and Matthew (Voice of Tommy)… sadly the only place with enough light to do this was the disabled toilet – that’s the first time I’ve ever played my trombone in the loo (first time for everything I guess!) This was a super busy day as we had to complete our tech rehearsals which had taken a little longer due to us being almost in the round, do a full dress rehearsal and then do our opening performance, which was also our Sheffield Press Night. All went swimmingly well despite the Tommy statue being left on stage post dress rehearsal and nearly staying there for the top of the show! The show was brilliant that night with a glorious response from our first Sheffield audience complete with a full standing ovation at the end. 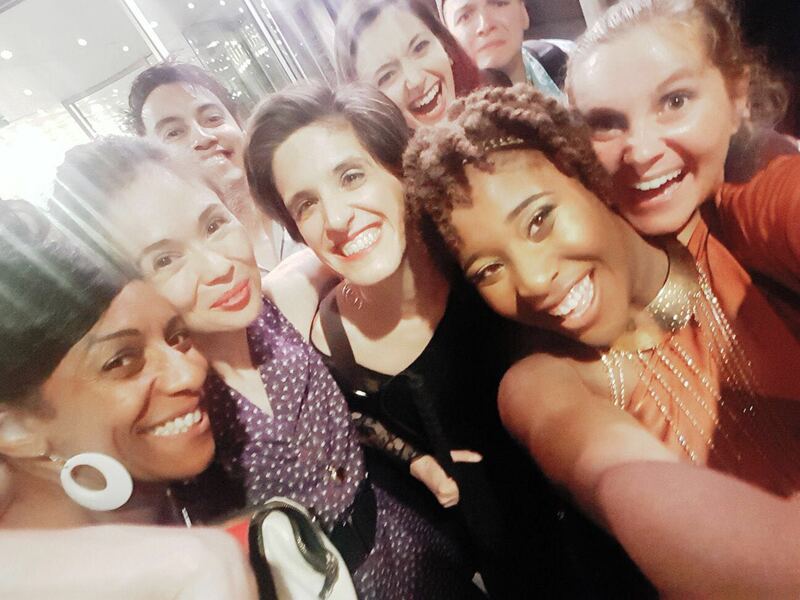 So we all piled into the green room afterwards for a cheeky glass of bubbly supplied by the Crucible Team and then onto the front of house bar for a lovely little do! Thank you guys! Press Night at Sheffield Crucible, joined by New Wolsey’s Sarah Holmes! Friday morning was a tricky one for poor old Natasha Julien (Dancer) as she thought that she had lost her bag whilst out the night before, so she sensibly cancelled her cards right before we found it in the shoe cupboard downstairs… fail! We naturally gave her a ribbing for this, she responded by threatening to turn her hearing aid off! Bah! After ‘bag gate’ most of us had the day free to a have a good old rest before that evening’s performance, and thank goodness because it was eventful! Donna had a particularly quick change resulting in her leaving Alim (Frank) to improvise….”what’s taking so long?”……. awkward pause……..”I need a new tie!”……. perhaps she’d popped out to get you one love! Hearns (Dancer) found himself jumping about after his chair (more than normal) during Pinball Wizard, Garry obviously missed the Awards Scene so much he almost did it anyway and Steve managed to get an ode to the Crucible into his track by pretending to play snooker with his bass during the encore! After such an exhausting day I was happy to retire home for a cocoa and a game of cards with my fab roomies Steve, Alim and Julian (Voice of Tommy). 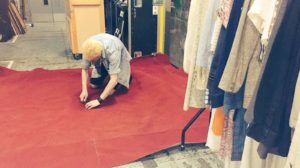 Cutting up the snooker carpet for our quick change area! 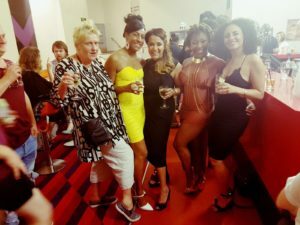 Saturday saw the return of the two show day beginning with Adam giving Amelia (Specialist’s Assistant) quite a shock during the warm up and Shekinah twerking, getting dressed and eating curry all at the same time in the dressing room… multi tasker! We had a particularly interactive audience for the matinee complete with additional BV’s for Acid Queen and a full row of dancing punters at the end… that’s what we like to see! Between shows we discovered that Hearns had forgotten to do his laundry for the week, resulting in him having to take a quick trip to Topman to buy some pants while the most epic Wagamama order was arriving at Stage Door… yum! That evening’s performance was no less busy with Natasha J leaving Amelia in Sensation 2 (for the second time! See, I’m not the only Natasha that’s done it. Soz Amelia, we both love you!) Hearns proved a handy Wardrobe No 3 during Act 2, Matthew got more stick for his ridiculous red trousers, Garry wheeled over Alim’s foot during the TV studio whilst trying to out-funny each other and Max (Captain Walker) almost had a reprise of ‘Gunfinger’ resulting in elongated inappropriate touching for Frank and Mrs Walker… all in all a pretty successful show both on the stage and behind! So we all decided to celebrate week one in Sheffield with a sneaky half at Crucible Corner where Adam announced that he enjoys being in ‘Thomas the Musical’, Connie spectacularly stacked it on her bum in the bar (she’s fine, she’s going to be fine) and Shekinah managed to get Las Iguanas to deliver chicken wings to her at midnight at the theatre bar… strong work my girl! Sunday saw a bunch of the gang heading for various eateries with one lot gallivanting off to the Peak District for a beautiful walk and epic roast dinner… well deserved guys! Just returned from your amazing show at the Crucible. Totally blown away! But very concerned for William and hope he’s OK. Well done the rest of the gang for a very professional response.